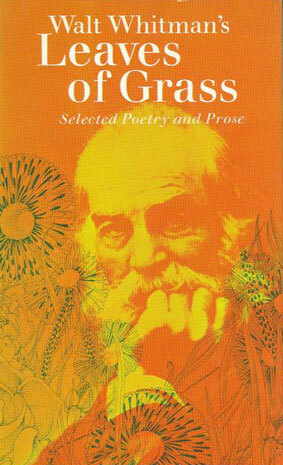 Over thirty years ago, my English professor awakened my senses with Leaves of Grass. Since then, time has drifted by, and the poems that were once fresh in my mind have faded into a memory of classroom discussions and debate. However, about a month ago, its silence was broken; for as I was weeding my book shelf, I pulled it out from its snug resting place. A flurry of familiar titles poured out as I opened the cover of this 456 page paperback and scanned its table of contents, ruffled the pages, and then promptly set it aside. Its volume was daunting. I found myself following what my own class of students probably would do; I contemplated its enormity. Yet, it took only a few minutes for the power of Walt Whitman’s spirit to quell my intimidation. Putting everything else aside, I settled comfortably into the couch with the full intention of allowing the editor, Justin Kaplan, help me become reacquainted with the poet. I began to read his introduction with the same anticipation one has when one hears the first few bars of an overture. I found myself looking up from the pages in order to reflect upon his words and then promptly proceeding to flip through the pages for more, like a hungry diner at a buffet. I couldn’t believe it; so many years had gone by and Whitman had drifted through my fingers like an old friend - before me was an extraordinary body of work! Leaves of Grass spans Whitman’s life as a writer. It is a reflection of life from the author’s point of view during a time when America was much younger, when our country was in the throes of political, industrial, and moral change. It became quite evident that Whitman was in love with his country and celebrated it in words that transcended a span of forty years. Walt Whitman was the new voice of American literature. He ignored poetic conventions, rarely used rhyme schemes, wrote in free verse, both in style and subject matter. He used colloquialism and regional dialects in contrast to erudite language and intertwined this technique with themes that were considered to be about everyday events and ordinary folks. His unique use of meter was deliberate - a way for the reader to get a sense of natural speech. Although it may not sound unique to today’s ear, it was drastically revolutionary for its time. Leaves of Grass is a compilation of Whitman’s “ensemble" of poetry, a lifetime achievement, which was in constant flux right from the start. As the United States grew, so did Leaves of Grass, and as the United States changed, so did Leaves of Grass. He spent years revising, assessing, and adding more poetry right up until he had completed his grand volume of work in the final edition in 1892. Often referred to as The Death-Bed edition, it hosted 400 poems; compare that with the first edition in 1855, a thin pamphlet of only twelve poems. Reading Leaves of Grass is a literary exploration, an uncharted expedition into poetry led by the author. It is a journey where frame of reference is relative to the reader’s specific place in historical time. One may engage the work in the present or, rather, accept the invitation and go back to the parlors of the gentry or perhaps the familiar farmhouses and look over the shoulder of the nineteenth century reader. We marvel as Whitman breathes new life into verse. Yet, in spite of our awe, Whitman provoked adverse reactions from the reading public. Scathing reviews, critiques, and criticism written by reviewers in the 1800s were negative, often finding his work often scandalous, loathsome, and highly obscene. Yet Whitman did not cower to the public outrage and rather than apologize he continued to create. However, it is fair to say not all agreed with the offensive posturing. On the flip side, there were those who agreed with Ralph Waldo Emerson who embraced Leaves of Grass as “the most extraordinary piece of wit and wisdom America has yet contributed." Whitman glorified moments in history and the democratic culture of the new America. Using his observations as thread, he weaves for us a narrative tapestry. Yet democracy for the poet was not glorifying "sameness" or "uniformity." Our first hint of this notion is derived in the very title he has chosen; for although Leaves of Grass could be interpreted as a kind of autonomy, the “leaves" envisioned by the poet were not those off a tree or a bush, but rather in the form of blades...blades of grass - thereby establishing the theme of equality, not compliance or conformity, a quality he held dear in a democratic people. Leaves of Grass has often been characterized as an American epic poem. The work opens with Song of Myself, and like Homer and Virgil, Whitman begins in a traditional epic style with the subject of the piece voiced in the first few lines where we can easily make a comparison with two of the most famous classical writers. The first line in Homer’s Odyssey is “Sing to me of the man, Muse, the man of twists and turns." Virgil states in The Aeneid, “I sing of war fare and a man at war." Whitman’s opening lines in Song of Myself is "Ones’s -Self I sing, a simple separate person,/Yet utter the word Democratic, the word En-Masse." Here at the very beginning of his work, we overhear Whitman’s bold departure from the conventional epic theme “celebration of a hero" whereby he side-steps away from tradition to “a celebration of one." This “I" he writes about embodies a new kind of American individualism, one that is representative of the new nation’s diversity. A question that bears asking is the following: “Did Whitman choose the epic form to influence the reader’s perspective as a communal voice of the times?" Perhaps. As a twenty-first century reader, we must take into account the political climate of the United States at the time of publication. We become the recipients of a literary history lesson. Written before us are verses that chronicle the events of the time. Composed from personal observations and reflections, Whitman’s poetry comes forth with a human and intimate quality, one that often shocked those readers of the nineteenth century. Personal memories of Abraham Lincoln, the day-to-day effect of of the Civil War on the common man, slavery, the imprisoned Chief Osceola, political elections, communities and towns, boys and girls, the sea and prairie sunsets; we get the full breadth of the United States. His work expresses his spirit as a man, a poet, and humanitarian. Whitman was a man of compassion. Having written about the Civil War, he honored the typical soldier in life and in death. His visits to the war hospitals of the wounded were recreated by unforgettable images that went from his heart, to his head, and to his pen. Just like St. Nick, he would often walk through the wards carrying a full satchel and hand out items such as tobacco, paper, jelly, pickles, and biscuits. Such gestures demonstrated the affection he had for a stranger which can be read in his poem "The Wound Dresser." Two of his best-known poems, “O Captain! My Captain!" and “When Lilacs Last in the Dooryard Bloom’d" define the grief he and the country felt after Abraham Lincoln’s untimely death. And so, I have rediscovered Walt Whitman. For me, he is not just a glorious poet, but a great literary inventor. He has given us a body of work that should not be read with haste, but rather savored. If I were asked to give a one-word definition of Leaves of Grass I would have to say “sublime." Perhaps it is Whitman’s own words that best express how deep an impression he has left behind: “The proof of a poet is that his country absorbs him as affectionately as he has absorbed it." Find a quiet moment for Mr. Whitman, you will not be disappointed.